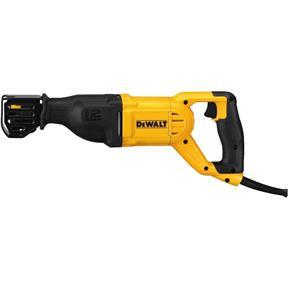 The DEWALT 12 Amp Reciprocating Saw will help you make quick work of demolition tasks involved in renovations and remodels. 4-position blade clamp allows for flush cutting and increased versatility and the keyless lever-action blade clamp allows for quick and easy blade changes. 0-2,900 strokes per minute and 1-1/8" stroke length deliver fast cutting and the variable speed trigger allows user to instantly control speed for whatever the application calls for. Tool weight is 7 lb. Corded, includes instruction manual.